Indexes are up nearly 4% over the last two trading days. Stocks opened higher and continued rising through the afternoon to end the day at session highs. 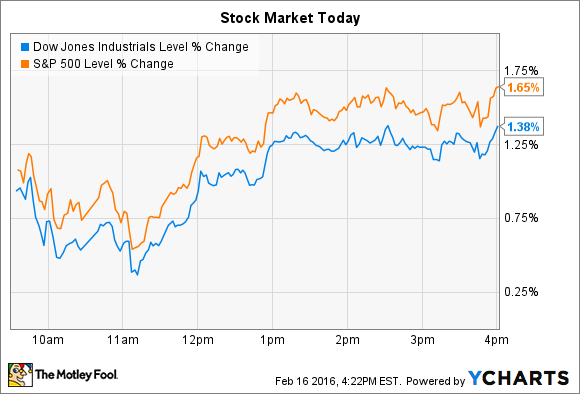 The Dow Jones Industrial Average (DJINDICES:^DJI) gained 223 points, or 1.4% and the S&P 500 (SNPINDEX:^GSPC) added 31 points, or 1.7%. Investors had loads of news from the long weekend to digest, including a promise by Saudi Arabia and Russia to halt their oil production as long as other big exporters joined in. Additionally, yesterday officials at the European Central Bank said that they stood ready to increase stimulus measures at their meeting next month, if needed . As for individual stocks, AMC Entertainment (NYSE:AMC) and Restaurant Brands (NYSE:QSR) both made notable moves higher today. AMC Theaters' stock jumped up 9% after an especially strong President's Day weekend at the box office. Action film Deadpool raced to a $133 million opening and shattered records for an R-rated movie launch (the previous record was held by The Matrix Reloaded in 2003 ). The film also set several new high-water marks for IMAX showings, and, as the nation's largest IMAX exhibitor, AMC stands to benefit disproportionately from that strong ticket demand . AMC's attendance levels, and the profitable food and beverage sales that go with them, are tracking solidly higher through the first three quarters of 2015. In fact, 7.4% more movie fans bought tickets through Q3 on 2015, which beat overall industry growth by nearly 4 percentage points. One reason for that industry-beating customer traffic: Capital expenditures are up as the company spends heavily on comfort upgrades like recliner seats. That traffic momentum was one reason why management in November said that they expect to post a record-setting fourth quarter and all-time high box office year when the company announces Q4 results on Feb. 29. Wall Street agrees, as consensus estimates call for AMC to post a hefty 13% revenue boost as earnings improve to $0.40 per share from $0.32 per share in the year ago period. Restaurant Brands, the owner of fast food chains Burger King and Tim Hortons, today announced surprisingly strong fourth-quarter earnings figures punctuated by a 25% profit bounce -- and the stock jumped 6%. Comparable-store sales improved by 4% at the Burger King segment, which was a slowdown from the prior quarter's 6% gain. That's actually a respectable showing considering that the restaurant chain met intense pressure from McDonald's (NYSE:MCD) new all-day breakfast initiative . For the full 2015 fiscal year, Burger King managed 5.4% higher comps thanks to improving breakfast traffic and hit innovations like chicken fries, compared to flat overall sales for Mickey D's . These two fast food giants can only expect to keep bumping into each other over the next few years. Restaurant Brands calls the U.S. market a "must win" geography for the Tim Hortons brand, and it has stepped up its plans for adding locations, most recently with big franchisee agreements in the Cincinnati and Columbus metro areas. "We continue to be excited about future opportunities at Tim Hortons and Burger King," CEO Daniel Schwartz said in a press release, "and are committed to building long-term sustainable growth for years to come."